Saito has concentrated its design and manufacturing efforts for many years on four stroke model engines and it has paid off. 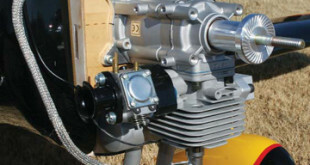 It have established a worldwide reputation for lightweight, totally reliable and powerful engines. From the small .30 cu. in. single, to the large 450 radial, it produces a wide range of displacements with many cylinder configurations. The 1.80 single is one of the largest, single-cylinder four strokes available and has developed a following in the giant scale crowd for its power and handling. With the release of the FG-30, the 1.80 is converted for gasoline. This is certainly more economical and with the integrated spark ignition, it becomes very docile and more user-friendly. The FG-30 follows the traditional Saito practice of a one piece head/cylinder and shares other Saito characteristics as we will see, along with a few innovative modifications necessary for running a gasoline/oil mix. According to Websterâ€™s, a Jackal is a smart-looking, fast-moving, smoothoperating, agile and intelligent mammal capable of extraordinary feats far beyond what you might expect from something its size. After four of us took turns flying the subject of this review, all of us now realize what Mike McConville had in mind when he designed this bird and named it the Jackal. The P-47D Thunderbolt, known as the mighty Jug, first flew on May 6, 1941, with Lowry P. Brabham as its test pilot. During WWII, it was the most feared ground-attack aircraft the Army Air Force had at its disposal, as it shot up and bombed countless enemy tanks, locomotives, troop concentrations, airfields, etc., throughout France and Germany, and in the South Pacific. For those who have been in the hobby for a while, the name â€œCoxâ€ is no stranger. 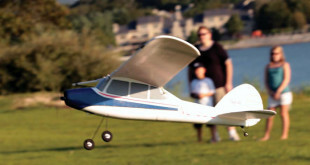 Many of us first started into the hobby with a Cox plastic control line model, and many RCers have used the venerable Cox .049 in various forms to power small aircraft, gliders or even helicopters. I started into the world of model airplanes with a Cox Blue Angels RTF model in 1977. Having sold millions of engines, it was hard to find anyone involved in this hobby who hadnâ€™t at one time ran a Cox engine. 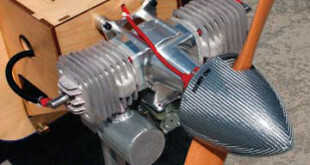 Back in the early 1990s, the status of Cox engines started to decline as various product disappeared off the hobby shop shelves, as well as many of the accessories needed to keep these engines running and tuned up. Through the last two decades there have been many Extra 300s modeled, but there are only a few manufacturers that listen to their customers and refine their models. Aeroworks is one of those few! In its introduction of its .60/.90 size version, it incorporated the requests of its customers and added to its successful line of Quick Build series of aircraft. One of the more unique things about aviation and aircraft is that both are wildly unforgiving of mistakes and inattention. This applies to full-scale as well as the model aviation we practice here. Opinions vary regarding the â€œbestâ€ transmitter handling techniques, but if you could compare them all based on the results obtained within a oneweek time period, you would quickly discover that certain techniques promote faster and better rates of learning than others. This article features the transmitter handling techniques that have proven during 1st U.S. RC Flight Schoolâ€™s four- and five-day primary solo and aerobatic courses to produce flying consistency and proficiency in the shortest amount of time. â€œScaling Outâ€? What is that? It offers a new category of RC model maybe, and certainly a super way to increase your modeling skills without taking the deep plunge into scarycomplex building from traditional kits or even plans. Iâ€™m not sure who invented the term, but â€œScaling Outâ€ has come to mean choosing an RC scale ARF (Almost-Readyto- Fly) airplane, stripping it down to bare balsa, modifying and adding details here and there to bring it closer to an accurate scale appearance, and then re-covering it, often with a more realistic painted finish in place of the original plastic film. At one time, there were perhaps a half dozen or more procedures associated with building model aircraft that were considered difficult, unusual and sometimes downright intimidating. These included applying fiberglass cloth and resin to a wood structure, sheeting foam wing cores, building washout into wing panels, applying heatshrink covering material, and installing a set of retractable landing gear. Since we are knee-deep into the wonderful world of ARFs, most of those mysterious procedures will never have to be explained again. All except one, that is. And that one is the dreaded â€œRetract Gear Installation,â€ or RGI, as we like to call it. Every so often an event happens that causes me to refocus my emphasis on safety in the RC world. The most recent incident involved a giant-scale model and a full-scale aircraft at a local fly-in, and serves as notice in my mind that the RC community needs to ensure that all safety considerations have been addressed and remain in our collective focus at all times. We're at a great time in our hobby. If you look back just a few short years (five are all it takes), you'll see that flying .60- size aircraft no longer means that you are limited to flying a nitro plane. You can pick virtually any .60 aircraft on the market and install your choice of nitro, electric, or 20cc gas powerplants. Flying Styro Kits (FSK) makes a series of fantastic electric single-motor and multi-motor small scale warbird models. Theyâ€™re highly prefabricated, but I do not consider them to be ARFs. I classify them as â€œlimited-work flying model kits.â€ All the major and minor foam and plastic parts come painted, but it is not unusual to have to fit and trim many of the parts. I have reviewed many of these models in this magazine over the years, and they have all flown exceptionally well. My goal in this article is to show you how to rework the canopy to enhance the scale look of these exquisite models and/or make it a little easier for you to have a good-looking canopy.